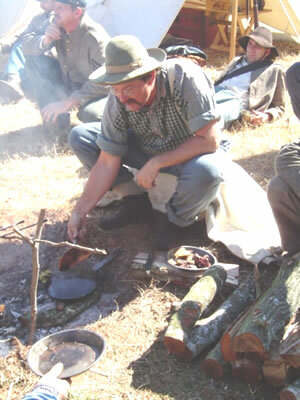 The Regiment	utilizes	both a part time Commissary, under the direction of a Commissary Sergeant, and field cooking in small messes by the men in the ranks when on campaign events. 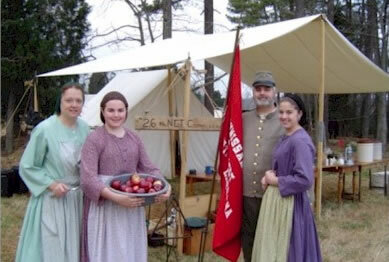 The garrison style events often lend themselves to better use of the Commissary. The type of meal preparation is decided in advance and incorporated in the regimental schedule. By utilizing both methods, we can adapt to any type event or scenario while also exploring this facet of a soldiers life in the field. The Regimental Commissary provides full meal services at several events each year. The Regimental Commissary Sergeant supported by his family and other dedicated volunteers provide this much appreciated service to the membership. The fully equipped Commissary is capable to providing full meal services the largest of events where our numbers have approached over a hundred in the field. When the Commissary is present at an event, the field companies of the Regiment rotate Commissary duty with one full company being assigned to each meal time. They men assist with water details, firewood details, and cleanup. At many events that the unit attends, the regiment camps in a "campaign" style setting. In this setting, the men travel in light marching order with small tentage or no tentage at all. The men carry all necessities within either a knapsack or bedroll and eat out of their haversacks. Veteran members and members of the Authenticity Committee strive to educate the membership in the many ways and means to explore food preparation in this method and will assist new members in learning these skills. It is in this type of setting that the true strength of the Confederate Soldier was most evident as they became some of the best light infantry in the world. By eating and preparing meals in this method, we reconnect with the skills and ingenuity that comes with this type of activity. In addition, the bonds of friendship developed within the ranks continue to strengthen as comrades share rations around the firepits. Such moments could never come from a book.